For the latest school news, as reported by students, check out the JHop Times Website! Shirts: Polo-style collared shirts in solid black, hunter green, or burgundy. Hoodies/Sweatshirts: solid black, hunter green, or burgundy. Pants: Khaki colored or blue khaki. NO DENIM. Shorts or Skirts: Khaki colored or blue khaki. NO DENIM. Must be at least knee length. NO basketball shorts. No pencil or spandex skirts. Magnet programs focus on a certain theme with specialized curriculum in areas such as arts, communication, science and technology, and gifted studies. Some programs have eligibility requirements. Students living in the specific attendance area for the program may apply. At John Hopkins Middle School, our magnet program is a point of great pride. As the county’s Center for International Studies in the Arts and Multimedia Journalism, we offer classes fine arts, performing arts, journalism, TV Production, and multimedia technology while engaging students in an intellectually challenging curriculum as an International Baccalaureate Middle Years Programme Candidate School. 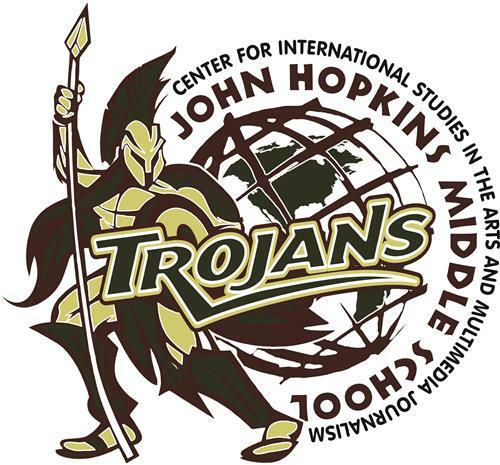 John Hopkins Middle School Center for International Studies in the Arts and Multimedia Journalism is pursing authorization as an International Baccalaureate Middle Years Programme School and is currently an MYP Candidate School. 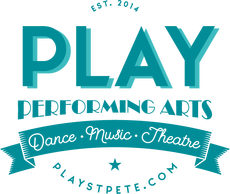 The IB MYP is for all students in grades 6-8. The aim of the IB MYP is to develop internationally minded people who, recognizing their common humanity and shared guardianship of the planet, help to create a better and more peaceful world. Students are encouraged to examine their world from all angles, giving students the skills to look at issues from a local, national and global perspective. The IB MYP strives to help all students intentionally develop the ten IB Learner Profile attributes to become Inquirers, Knowledgeable, Thinkers, Communicators, Principled, Open-Minded, Caring, Risk-Takers, Balanced, and Reflective. While developing the ten attributes, students take courses in eight subject groups: language acquisition, language and literature, individuals and societies, science, math, arts, physical education and health, and design. At least one unit during each school year will involve be interdisciplinary and will involve all subject areas. In cooperation with the IB MYP curriculum, students may choose to participate in focus classes in art, dance, instrumental music, theatre, vocal music, or multimedia journalism. Students who choose a focus area will have the one to two classes in their focus area assigned in the class schedule. Their focus class is the arts portion of the eight subject groups. 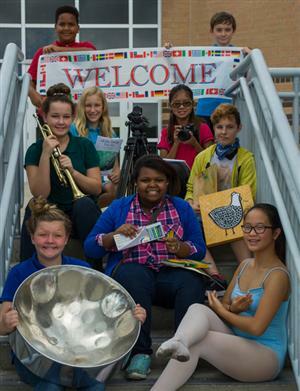 John Hopkins Middle School Center for International Studies in the Arts and Multimedia Journalism strives to include all students in the classroom. Each student at John Hopkins will participate in the IB MYP classes growing them into lifelong learners and global thinkers. * John Hopkins Middle School is a candidate school for the Middle Years Programme. This school is pursuing authorization as an IB World School. These are schools that share a common philosophy—a commitment to high quality, challenging, international education that John Hopkins Middle School believes is important for our students. JHop Times Named Best Middle School Newspaper!